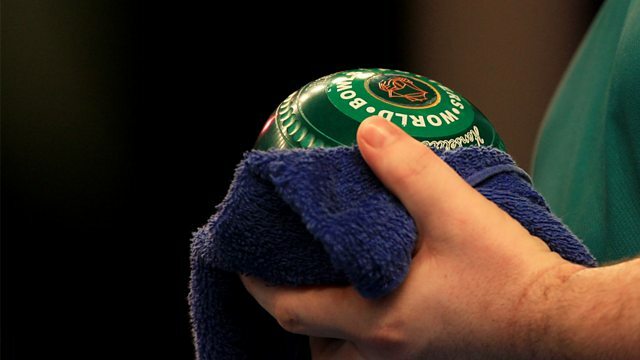 Rishi Persad presents live semi-final action from the World Indoor Bowls Championships at the Potters Leisure Resort in Hopton-on-Sea. Commentary comes from David Corkill. Browse content similar to Semi-Finals. Check below for episodes and series from the same categories and more! always loved. I've been very successful. It's my second home. pinnacle in our sport, whether it be singles or pairs or whatever. the time. It's semi-final Saturday in the open singles Championship. the world batting it out for the two spots in tomorrow's final. This is the match-up between Paul Foes, and Les Gillett. quarter-final. 12 hours later he battled hard to stay in this match. Gillett needing a double. His drive was only good enough for one shot. Paul Foster was through to his sixth world indoors final. he'll play Anderson or Harlow. BBC's David Corkill alongside me. weekend of this tournament, the most important in the sport of bowls? the sixth time. The only person that's beaten him before is Stewart. waiting in the ditch. My goodness, he's fluked it. I don't believe it. all over again. I won in Scotland. I've been really happy with my game. semi-final. He's got a great record overall. fortune sometimes but it's always there. He gives it a good chance. what you are doing, he's here to do his job and he's doing it well. crowds, they are so amazing and I really, really enjoy coming here. don't come around too often. You need to take them. naturally talented players in the game, 31 years old. rink. It's time to say good afternoon to the MC, Richard. Indoor Champion, give it up for Stewart Anderson. side. On the back hand, he played a good ball. balls. Decent. Both players will be happy. caught it half bowl. Greg Harlow off and running with a double. with sweets. . A baker by trade. He's always very good. going today. First bowl on the forehand. trail on. Ideal position is between the jack and the red balls. youngsters from the White Oak in Swanley in Kent not far from myself. Greig out the traps the quicker of the two at the moment -- Greg. Nicky was. That's the difference. Greg is lying better. little bit short. Still two down. Problems again for Stewart Anderson. hit there. This is a difficult shot to gets out of. Just a draw David. Needs to add a foot on to his previous delivery. Back hand draw. Greg Harlow able to deliver the jack to his favoured length. Stewart but he's losing the battle with the first two. early. Needs to do something quickly. Harlow will be adding another shot in here. This is probably Stewart's easiest chance. 18 to 20 inches to draw. Good try, good weight. You can drop into position on the green ball. Draw another shot and position at the same time. Final bowl of the end might be the forehand draw David. Same thing. probably the happier of the two players playing this forehand sides. worry about the position, just draw the shot. Change of length. first-round matches. Jack length, 29 metres. front toucher. The next one needs to be behind, that's good. going to be about strategy, tactics, trying to outthink your opponent. Just dropping through again. I don't think that was meant to be there. but of course they play a lot of other sports. It's in the mix. little bit to have the width. Stewart Anderson another single. the wind dropped, it was perfect. This one, touching the jack. stay within the confines of the rink. This should be number two. Just needs to run. Still a yard. after it, if it is the number one shot. Oh, that's narrow. That's very narrow. I don't think he'll hold up. could run it out. I think it's just a draw. double. He's had one go, this should be better. road, a yard more weight draws the shot. the bowl goes into the ditch without touching the jack, it's taken away. then. So we've got all sorts of colours available. Those stickers have been through the mill a bit! Certainly have. Certainly not a new pair. Or a new grouping of stickers. Greg slapping the thigh. I think he's high and wide. from having a go at it. The angle's good to get the two red ones out. Stewart needs another one, at least up to his own bowls, if not behind. draw, as we call it. Pushing in with a foot or two of weight. The crowd shouting there, "Turn. Turn." He knew it was slightly wide. to probably score the last two ends to have any chance of a tied set. previous matches, it's the pattern that we expected it. He's really playing well. Instantly taking the shot away. Just have to push through it a little bit, so easy to drop. played that well. Same line, just a bit extra weight. chance of scoring. This would probably be number four coming in. wing bowl. There's gaps there. But there is a shoulder to come off. almost guarantees the set. I think he's wide and heavy. I tell you what, this is coming back like a train. Jack was off centre, that made a big difference. Two it is. Good by both players towards the end there. a really good first bowl and you drop it a bit short in the line. give Stewart problems, especially if Greg gets in first. the running ball or the draw? I reckon just a draw at this stage. Wide-open forehand, though, if he needs to play the runner. Have close, if he runs the distance. The crowd are urging that ball on. forehand. Shake of the head from Stewart. Forehand is his favourite. Anderson. Awkward shot for Greg. That's why he's taking his time. one. Let it run down to five or six seconds, then take a time-out. quite useful with the ring, we can see the respot position there. the opening set. Taking a bowl out is no good. Has to be the jack. is. I think this is two to Stewart Anderson. that. It's a great idea. It's for charity. is a bit long for me. I bet they've got a lot of help. I bet they have. it. I think he is trying to block it. amazed at that as well. That was not blocking the shot by any means. play a loose ball. I don't like these sort of ends. one. He has the weight, he's definitely around it. he lives and, of course, he works at this venue. fixture up in Scotland today in Midlothian. chucking through a little bit. Slight adjustment needed. probably for second. But he would have been aiming for the green bowl. Same line from Greg. Doesn't need to change anything. Good chance. seconds, but it's so difficult to get the red ball out. guaranteed. It's one of these awkward ones. but that's a very, very bad result. A perfect strike, terrible result. it. To be truthful with you, it's completely different, it really is. The ability to come around bowls is immense. required. Well, now, here we go. All sports have their strategies. could the back one as well the way it's angled. Greg hits this target. It still may two wrong but he's running at it. Wider this time. Close. That's what he was looking for. APPLAUSE. Back in the set. one was always going to lock in there and he knew about that. Both players so aware of the importance of the first two. that one. Not as comfortable on this side. ball on top of the jack and he's almost certain to score. that one. You have to be there. No good dropping two inches too short. he's got the running. He'll make it. Beauty. APPLAUSE. Very good from Stewart Anderson. early. No, fairly calm and relaxed. APPLAUSE. you try and take it off and you end up five feet short. It's enough. Stewart will still feel confident he can draw this. deliveries in this direction may have put him off here. bend. It's heavy this time, that's the problem. That was the problem. there. It's not a problem on the third. APPLAUSE. They want to see a tie-break. Now they'll look at the fourth one. Got to be a measure, I think. LAUGHTER. The um tire will sort this one out. was three because he pushed the red out. It's three shots, definitely. jack up. Just dive in the way of it. Stewart needs to run with this one. presenting himself with a nice position on the other side though. hand. Same bowl as the last, back hand draw. again Greg needs another bowl in here. Two seconds again. was only one shot down. Three ends, two ends to go after, this lose one. stage, one shot, he now has to win the last two ends. Yes, he has. the last end previously. Good tactics. Tried to get in first. struggled the last time in this direction. Both bowls yours, two feet, Stewart 20 irges. now from Greg. He's a local man, who lives close by. Works here. indeed. Little touch was enough to straighten him up. Four-and-a-half inches, it will still be the backhand draw for Greg. head, doesn't it. It's not easy to make another one, either. think so. That is a little gamble if he wants to put red ball onto jack. these, David. Fiance Claire and dad Billy will have worked that one out. quite. There's room still around the bowl to draw the shot. Looks to be slightly under. It's very close. He's got it perfectly. Stewart is forced onto the forehand. He needs to draw within four inches. high side. He will have to play a shot to get it. Tense times. Anything behind is going to be good. This is quite an easy shot here. bowl he hits, that one's the key one now. Forehand runner. Not easy. It holds off in this hand. Gone a bit stronger. Is he under? He's definitely under. How's the connection? Oh, that's horrible. That's a horrible result because he's taken his own plant bowl away. better shot in. That's good. This one's good. draw the shot. I just don't think he gets a good result with the drive. He'll be happy to hit half bowl and talk it out. He's playing your choice of shot. Oh, he's under. It's a tie-break. always looked like it could be very, very close. Stewart has three timouts remaining. That bowl sat there the whole time. Yes, the opening bowl was the winner. The trophy. On the first end Greg won the toss. Greg's won the toss. crucial. The last two rounds he's won the match with the last bowl. this match, but he hasn't been as dynamic with the first two balls. don't feel as though that's close enough. has to go again. He won't want to leave a shoulder on the backhand. That's the dangerer. If he wants to play that, the forehand's open. Either way, I have a feeling Greg will attack it with the next one. lost the pace in this direction. Interesting to see what Greg plays. this one. That's what he's playing. Looks to be wide from the hand. doesn't want to put the two bowls together. anything, but on the forehand, stay away from the backhand. He's a clever player. Yes, I think. So I think it was a forehand draw. bit more. That's good. I think that's very good. His line too. still think he'll run the jack, though. Coming down to have a look. The respot positions just looking at it. think this is the right shot. Drchl. Pushed it out on a decent line. of a nervy one. You can't blame them for that. You would expect that. different. There's no mistaking the singles. think it's still the backhand draw for Stewart. Something not right about it. Reaching through. Can't blame him. he's not short. That's a long way heavy from what he's looking for. life really difficult. I think it's just staying away quite simply. bowls that have been heavy. He likes it. Well he's certainly interested. is just going oh, what's going on here - please don't do this to me. Both players just praying. Stewart shaking his head. He favours green. That looks to go through quite easily. I think it's green. Wow. Once again Greg Harlow sour voifrz. What did I say -- survives. were tense, this is really going to test both the players. shot. I don't think he's passed it. No, he's not running. Oh, dear. Wow. that arm, nice relaxed delivery, push through the ball. using a flatter bowl. Now, has he got enough this time? Certainly wider. Will it get back, that's the question. think he has. That's the shot. It's very beatable. chance of bringing a red bowl in, with this other red bowl in as well. that your luck is in. Simple as that. You did call this bit way. Last two matches - forehand runners, one bang on target, one off target. played before to try and get to the world final. call it fortune. He was in the area. Greg Harlow is through to the final. What a match we've seen, tomorrow's final is on BBC Two at 2. 30pm. more match to go, join us tomorrow for the Open singles final. Bye-bye. Tom Jones, obviously. Winston Churchill. Invented the bicycle. The internet. Telephone. The best indoor players from across the globe gathered next to the Norfolk coast this week and now we're down to the last four in the singles. Commentary comes from David Corkill.